Congratulations to all of the finalists for a stupendous series of squamous swords. May you all prosper under the gaze of our damp lord! 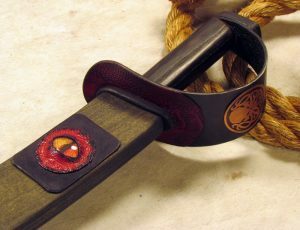 This finely crafted, adamantine cutlass (use the stats for a scimitar) has an eye motif etched into the blade. While you possess this weapon, you are afflicted with the flaw: “I feel like someone is watching me, waiting for me to make a mistake.” No magic or other effect can cure this flaw so long as the Blade of Ancient Visions is in your possession. This flaw vanishes 24 hours after you rid yourself of the weapon and complete a long rest. Once attuned, you gain a +2 to attack and damage rolls made with this magic weapon and the blade starts to secrete strange, viscous oil. 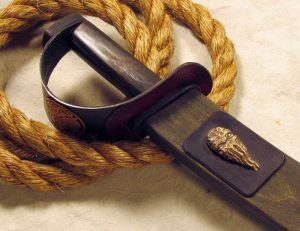 Any creature wounded by the blade must succeed on a Constitution saving throw DC 18 or be poisoned. While you hold the drawn blade, you can use a bonus action to gain the effects of true sight. This functions as per the spell, but you sense the presence of strange beings looming just outside your peripheral vision. You can never directly see them, but you know they are watching you and waiting for something. Since an expedition discovered the Blade of Ancient Visions in the ruins of the city of Vunigothu, every creature that has possessed this cutlass has died horribly, including Lady Erin du Martigues, the fallen paladin responsible for the halfling genocide a decade ago. Many committed suicide, but others were executed for the gruesome murders of their friends and families. Congratulations Anthony Jennings! It was a very competitive field! Thanks to everyone to everyone who voted for me! I really loved all the entries and I’m honored that my design was selected! Thanks to the other finalists who all created wonderful items that I will be borrowing for future D&D games! Thanks to Kobold Press for such a great contest!